Material choices can vary depending on area and use. 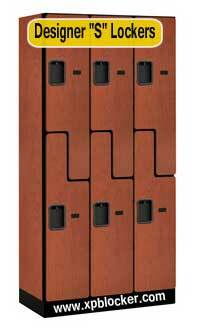 Solid Plastic Lockers are ideal for Spas, Swimming Pools, Showers or anywhere high humidity is a factory. Plastic laminated are a classic for the Golf Club Locker Rooms, Employee Locker Rooms and Offices. 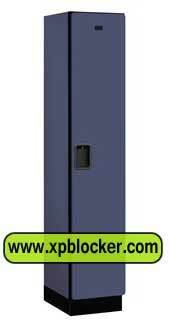 These lockers make wonderful employee lockers to fit Jackets, handbags and cell phones. Solid Wood Wardrobe Locker choices are also available. Solid Wood Lockers feature optional crown molding, and recessed wood finishing panels with stains to match high end office furnishings. Metal lockers offered in the heavy duty gauge metal designs, including all welded designs, are ideal for factories, warehouses, schools, and sports clubs. Wardrobe lockers are generally wider and deeper than the standard lockers. These locker designs can be found in Single Tier units with One Door per Unit or Two Tier units with Double Doors per unit. Anything smaller than the single and double doors do not generally accommodate hanging clothing without wrinkling or crumpling garments. Most wardrobe lockers are offered in 12", 15" and 18" Widths, in some materials as much as 21" Widths and 12" to 21" Depths. It is recommended that you take into consideration the uniform or clothing you wish to accommodate as a hanger needs about 15" minimum depth and a pair of boots as much as 14" - 18" in some cases. Single tiered and double tiered locker configurations are equipped with Shelves, Optional Coat hooks, with Base and Legs or without base and legs. Additional custom options may include featuring your company logo onto the solid plastic doors. Ask about lockers Door upgrades to be Vented or Mesh for ultimate aeration. Equipped with recessed stainless steel latch and hasps, choose to upgrade latch with a variety of locks. 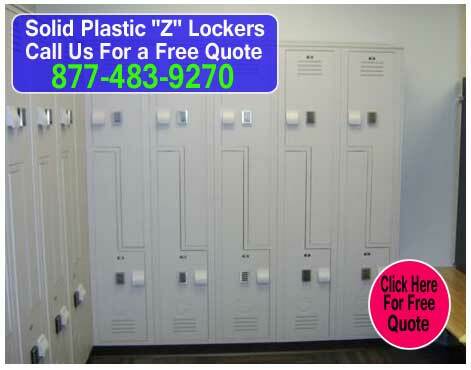 Solid plastic lockers can be equipped with Coin Retain and Token Retain or Return Locks, Digital Electronic Locks or Computer Aided locking systems. Digital locks are available for all lockers. All lockers are equipped for standard hanging padlocks. For establishments that require Handicap Lockers, please inform your locker specialist of this need and your lockers will be quoted to conform to ADA code compliance. 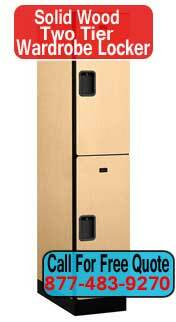 Lockers designed under the ADA code must be properly installed to be fully compliant. Wardrobe lockers are also offering a 2 unique style designs in the two tiered locker option. The Z Locker in Solid Plastic offers an area for longer uniforms to hang, an area for a grip, boots or shoes and a shelf for hat, purse or cell phone. In a similar design Plastic Laminated Lockers are offered in a S locker design which also offers a larger area to hang uniforms to hang, an area for a grip, boots or shoes and a shelf for hat, purse or cell phone. Depending on your layout, area requirements or architectural specifications, there are many solutions for Wardrobe lockers that can be conformed to fit your locker needs. Lockers specialists look forward to helping you with requirements to best fit your business model. This article was published on Friday 21 March, 2014.